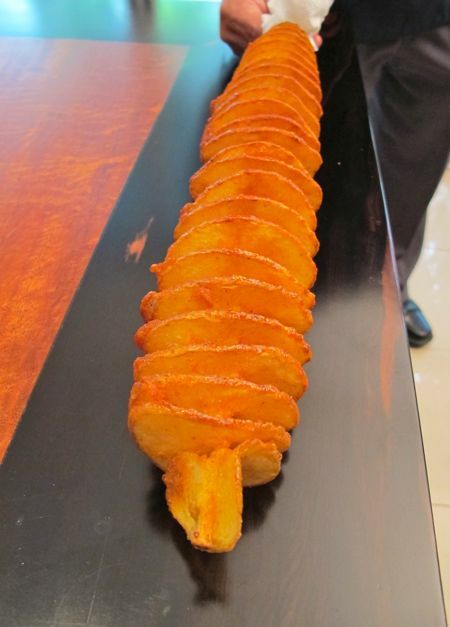 They are called Potato Twister here. $3 per stick. My son gets ‘takaw tingin’ orders them and cannot eat through halfway. They are best eaten on the spot as they get soggy fast. they have carts in malls all over, and we have them even here in davao. i think they’re called tater twisters or something like that. my sister from the US fell in love with them last time she was here. they don’t taste oily at all, and are light and crisp. i hope they do the same thing with sweet potatoes. had barbecue and cheese flavors. Pinoycook also blogged about this :-) looks appetizing! There’s one in Shopwise, too. Plus a Majestic Ham stall. I didn’t know you could buy the bones from them. Thanks for the tip, MM. I have been wanting to try this. It’s so cool to see how they cut and fry it! Thing is i have no self self control for fried potatoes. I can’t just stop with one…..
My daughter buys this from her school’s cafeteria. It costs P35 a stick and it’s available in different flavors as well. some carts even offer three flavors in 1 twisted potato :D i wanna know if how can they cover the slices in 3 separate flavors! Interesting but I find it too salty for my taste. Those twister potatoes are very common here in Seoul! There’s actually an itinerant vendor of this pretty near my flat! Once in a while I give in to the call of cheese twister fries. Actually saw a handheld device being sold at a shop here to make these twister fries. Never felt the need to buy though haha but this post has made me want to get one na! hmmm…they can be used as table accents along with other edible stuff!